A musical theater experience tracing the storyline of spiritual unfoldment. From the beginnings of the quest, the inner journey continues through the arduous challenges of self-mastery, the onset of mystic awakening, and on to the realities of higher life. From humble beginnings a profound magical ambience gradually emerges through the weave of songs, stories, prayers and dynamic theatrical athletics. At times simple and ingenuous, humbly blunt and humorous, surprising or audacious, powerfully evocative, poignant, delightful, thought provoking, insightful, reverential, prayerful and ultimately inspirational. 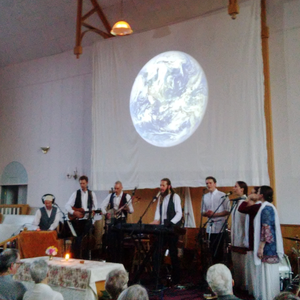 Earth Vespers is a musical service in celebration of the beauty of Mother Earth, compassion for all who live here, and the interconnectedness of Life. With fiddles, folk ballads, saxophone sing-alongs, a cappella anthems and reverential hymns, many genres of music are woven with inspiring readings in this mindful, heart-filled celebration of honour and gratitude for the miracle of Life on Mother Earth. An immersive experience of living and working within a community of those gathered for a time of dedicated, undistracted, full-on self-discovery, service, and transformation. Seminars do not have a fixed program, instead each event occurs around the needs, capacities, and circumstances of the participants. Programs frequently include movements, meditation, self-observation and self-satire, specialized theatre improv, creative arts and music, dialogues, lectures and debates. A demonstration of rarely seen movements and music. From contemplative moving meditations to fiercely energetic dervish dances, these movements spring from living sources of ancient traditions, both East and West. 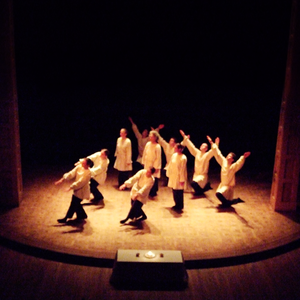 The program includes extraordinary forms of dancing meditations as well as a selection of treasured movements from the Gurdjieff legacy, carried forward to these times both as moving prayers and as a unique practice invigorating the inner striving to know oneself and cultivating the integration of body, heart, and mind. An opportunity for those of diverse pathways to join together in heartfelt celebration and Prayer. Reverential, joyful and mystically invigorating, this musical service invites a humble recognition of the Spirit that moves within all things and within all faiths. Honouring each participant’s divine connection, and at the same time remaining respectful and harmonious with many diverse spiritual traditions. The themes, readings and songs are consistent with the universal teachings on human conduct, ethics and integrity. This event aims to catalyse a powerful recognition of the Unity within all faiths, in an atmosphere of joyful celebration, inviting the participants to come together in harmonious and powerful prayer on behalf of all life on planet Earth. With a lot of laughter, a little bit of chaos, and plenty of good-hearted fun, traditional dances are a great way to celebrate and build community. Solaris school concerts combine timeless principles of reciprocity and compassion with memorable music to inspire and encourage care and understanding in next generation of creative leaders. Although our performances are compatible with many faiths, we understand that religious or spiritual references of any kind are not always appropriate to the occasion. For schools we present a selection of songs that deliver a message of virtue, joy, and mindfulness without any specifically religious content. We're working on our schedule for the coming months. Check back soon for event dates. 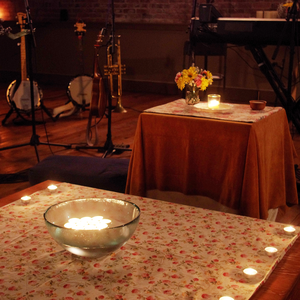 Earth Vespers is a musical service in celebration of the beauty of Mother Earth, compassion for all who live here, and the interconnectedness of Life. With folk ballads, saxophone sing-alongs, a cappella anthems and reverential hymns, many genres of music are woven with inspiring readings in this mindful, heart-filled celebration of honour and gratitude for the miracle of Life on Mother Earth. The 9 piece musical collaboration Solaris brings West Coast folk-roots fusion to the Larcom Theatre, in Beverly. With vibrant vocal harmonies, solid folk-roots instrumentation, and a repertoire of powerful original songs, Solaris delivers an uplifting musical message of awareness, kindness, and positive change. 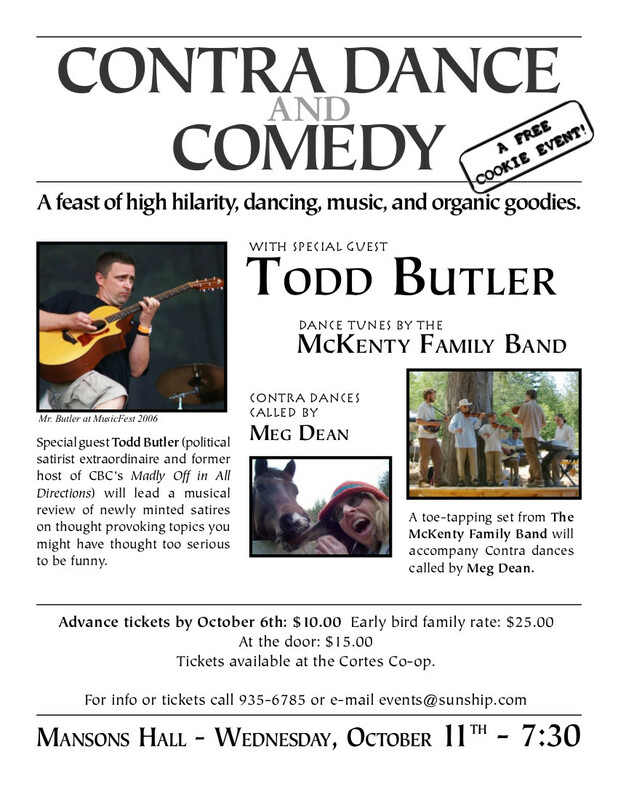 Enjoy a fabulous, locally-sourced gourmet four-course meal, amazing art, silent auction and two bands, including The Merry McKentys. To allow, and encourage the heartfelt reverence of people from many pathways to join in prayer, for humanity, for all life, for planet Earth, and for all of Creation. 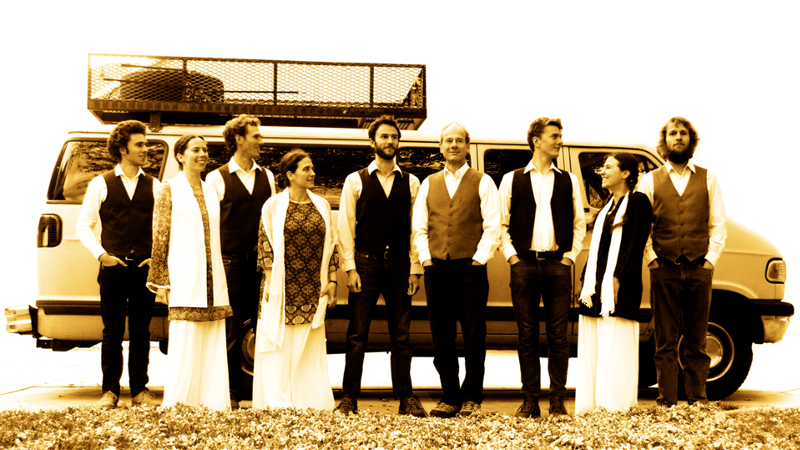 On our musical travels, we have participated in many different spiritual events and services, sharing the Solaris repertoire with adherents of many faiths; Christians, Hindus, Buddhists, Sufis, New Thought practitioners, Pagans and agnostics, to name a few. Regardless of the differing religious contexts, we have repeatedly witnessed profound heartfelt recognition. We have also participated in a variety of interfaith services. Each of these events was assembled from pieces of religious ritual performed by a Priest, Pastor, Rabbi, Imam, Roshi, Medicine Carrier, or ceremonial leader of the religious tradition from which it came. These services offered an experience of each tradition's prayers, and demonstrated the leadership's mutual recognition and commitment to the reality of interfaith harmony. The sincerity, tolerance and willingness to encompass spiritual diversity by both the ordained and the laity was impressive. These events gave an inspiring glimpse at what could be possible: a simple, sincere, joyful, enthusiastic, artful and reverential service / ceremony / celebration that is at once inclusive, whole and mystically invigorating. Compatible with many faiths, consistent with the basic teachings on human conduct that all faiths share and inviting to the Spirit that moves within all things and within all faiths. Join us on Sunday and participate in this inaugural effort to realize this possibility. With vibrant vocal harmonies, solid folk-roots instrumentation, and a repertoire of powerful and relevant original songs, Solaris delivers an inspiring musical message of awareness, responsibility, and empowerment for positive change. Magician Steffan Soule focuses on the power of attention and how we can use it to apply the Golden Rule in a variety of situations in this exciting, positive and educational anti-bullying presentation. Join us for a lively evening of traditional dancing and live music! 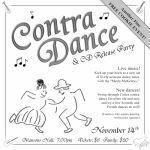 Contra dancing is fun, energetic, and easy. Our cheerful caller will have you kicking up your heels in no time! 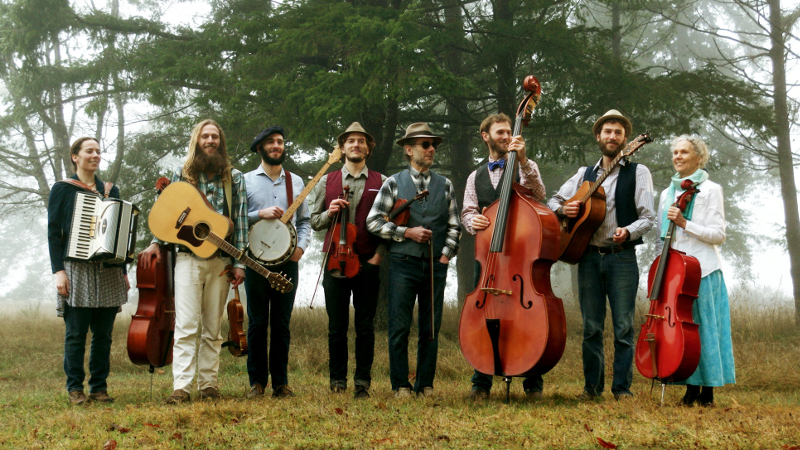 Sweet fiddle harmonies and happy foot-stomping dance tunes from The Merry McKentys. Get advance tickets at Rufus' Guitar Shop or Highlife Records, or online at Brown Paper Tickets. Find out more about contra dancing on the Merry McKentys Contra Dance page. 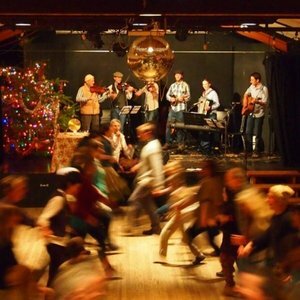 Join the Merry Mckentys for a free Christmas Contra Dance and the release concert of their first studio album Out of the Woods. Live music, organic refreshments and dancing for the whole family. Everyone welcome! Relevant lyrics and sweet vocal harmonies combine with acoustic guitar, keyboard, mandolin, drum, bass and fiddle to create a musical experience that is humorous, insightful, audacious, inspiring and profound. An uplifting evening of down-to-earth inspirational music celebrating the quest for truth and purpose in life. 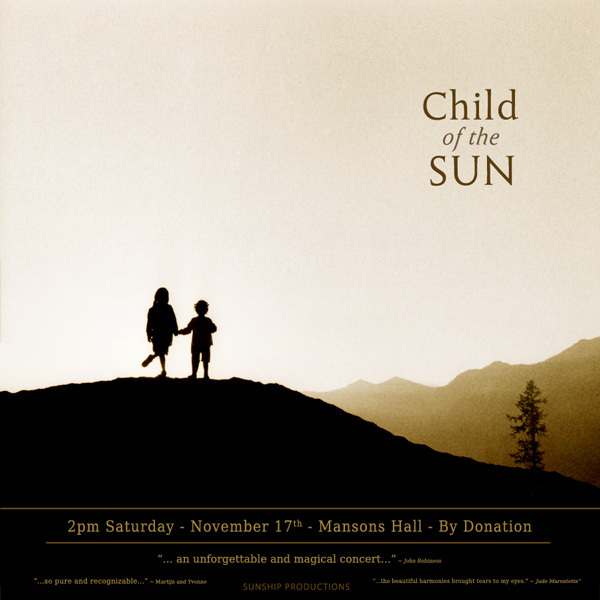 Original and thought provoking acoustic music with a merry band of radical young pilgrims. 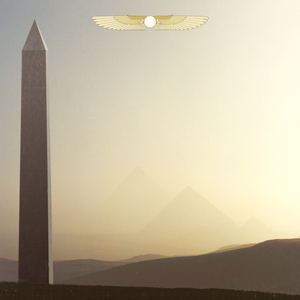 Timeless questions, contemplations and discoveries, fresh lyrics and memorable melodies. This heart warming evening covers the spectrum; subtly simple, ingenuously amusing, revelatory, profound. Accordion, violins, mandolin and guitar join in boisterous harmonies, playing perhaps the cheeriest set of traditional tunes you ever heard. 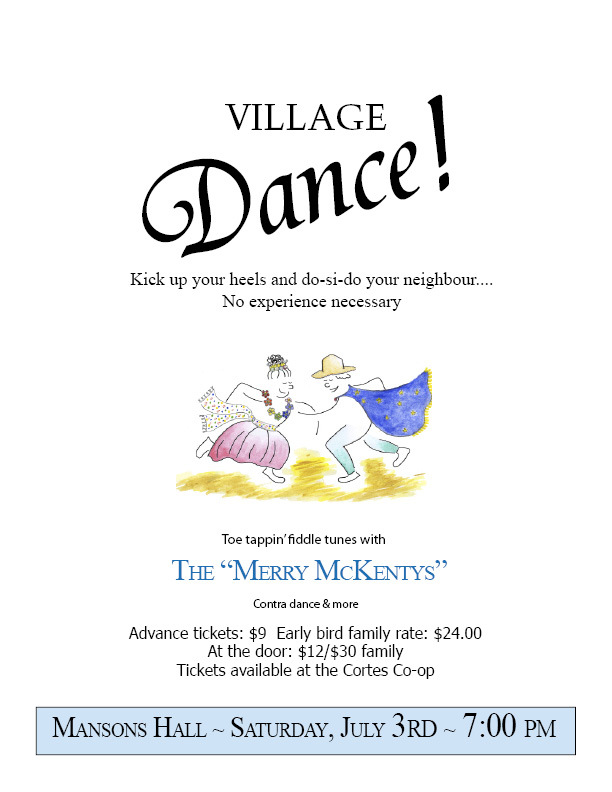 Up-beat traditional dances and hoppin' fiddle tunes with the "Merry McKentys". 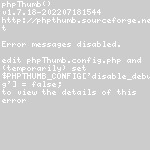 No experiance neccesary. 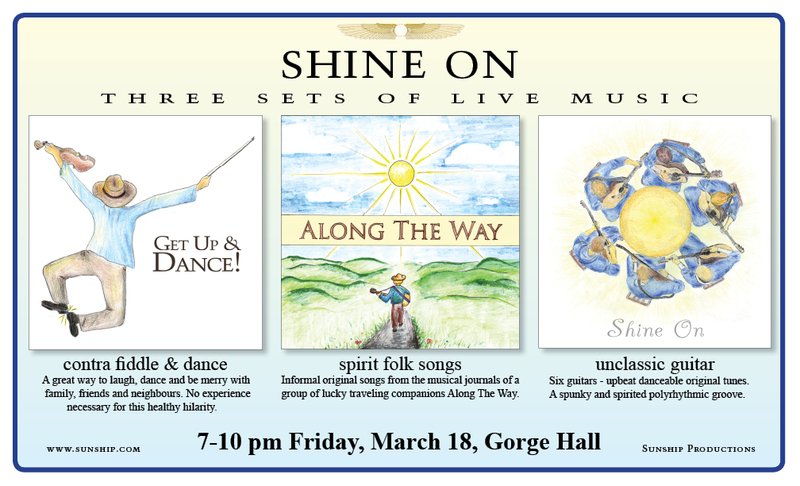 Three sets of live music: Contra dance & fiddling, spirit folk songs, and unclassic guitar. Original songs & stories. Paradoxes, humiliations, follies, inspirations and revelations Along The Way. remembrance in movement and music. 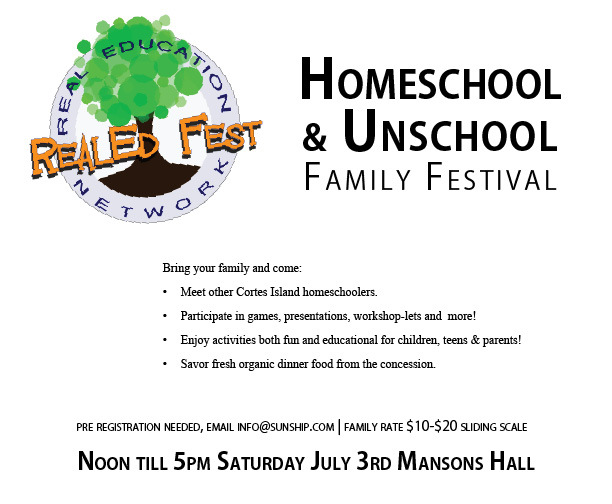 An afternoon with Cortes Island homeschoolers. Fun and educational activities for children, teens & adults. Games, presentations, workshop-lets and more. Hilarity. music and dancing with Todd Butler, virtuoso guitar-picking songwriter and former host of CBC's "Madly Off in All Directions" followed by a great set of village dances and toe tapping traditional tunes. Kick up your heels to lively traditional fiddle and acoustic music and do-si-do your way through country dance favorites old and new! Square dancing without the squares! Fun for ages 2-200. Get the live event CD here! Master sitarist Pandit Shivnath Mishra and his son Deobrat Mishra visited Cortes Island during their 2006 summer tour. Based in Varanasi, India, the Mishras tour widely through Europe and North America. 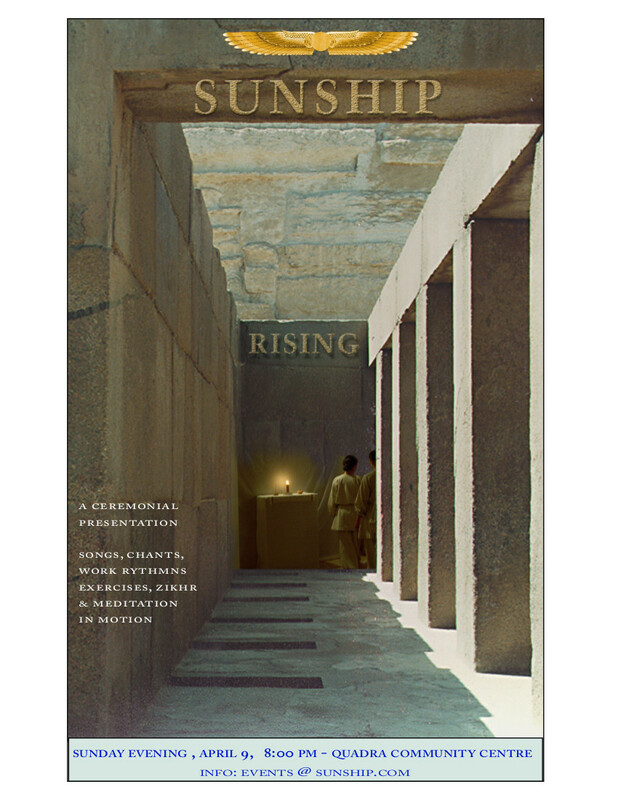 Sunship Productions hosted an outdoor Kirtan concert after their regular performance in 2006. 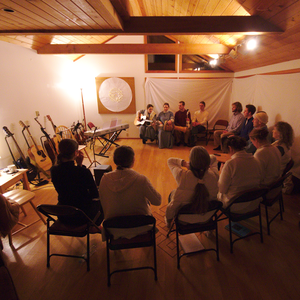 In the summer of 2005, Deobrat Mishra gave a workshop on Indian devotional singing at the IDEA gallery on Cortes Island. A ceremonial presentation of songs, chants, work rhythms, exercises, zikhr & meditation in motion. 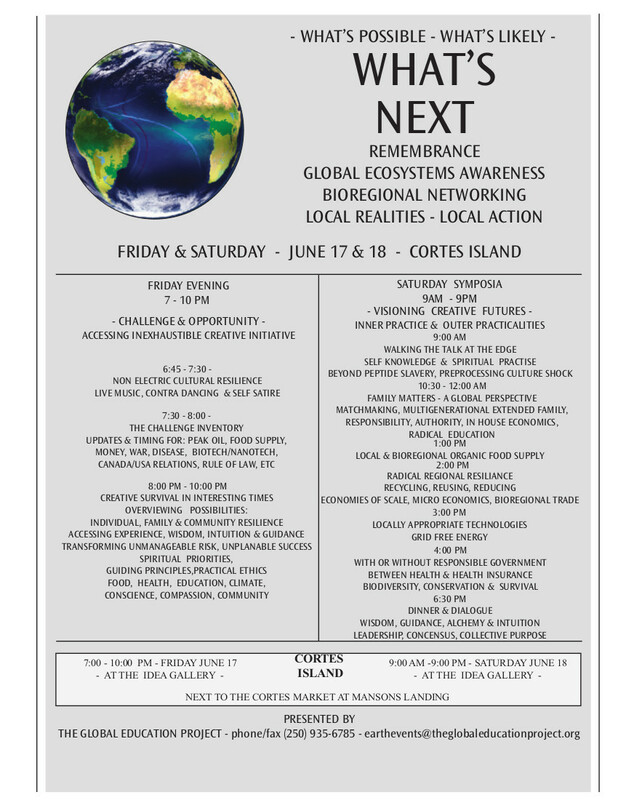 Global ecosystems awareness, bio regional networking. Local realities - local action. A visual, informational and musical presentation on the state of the world. 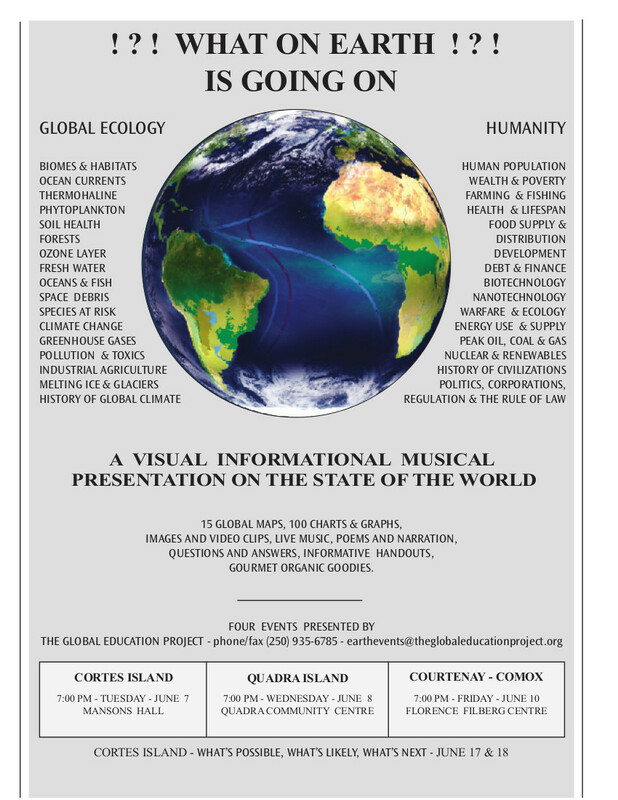 15 Global maps, 100 charts & graphs, images and video clips, live music, poems and narration, questions and answers, informative hand outs and gourmet organic goodies.